Did you just buy a new smartphone and are you left not knowing what to do with your old one? 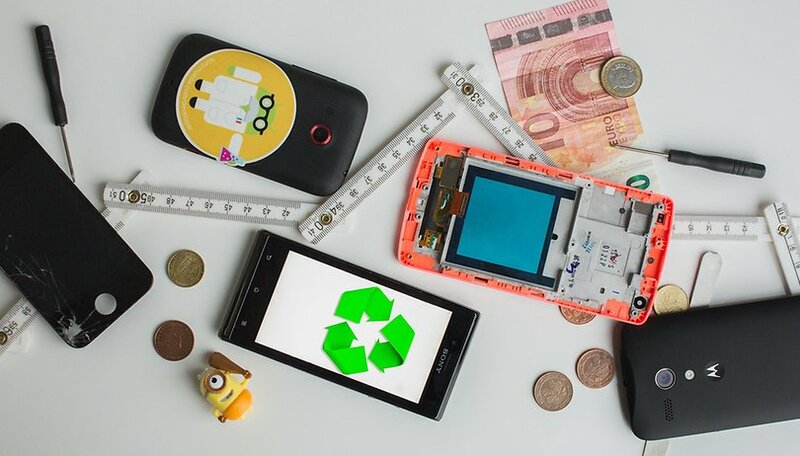 Selling or giving away your old device are certainly the most obvious options, but there’s also the option of continuing to use the old device for some other purpose. We have some creative ideas for you! USB modem or Wi-Fi hotspot? We all know smartphones can be used as remote controls, but how many of us actually use our current phone as a remote? Very few, I'd expect. But if you have an old phone that you don't need to take everywhere with you, you can use it as a permanent remote by leaving it near your TV in your house. You can use it to control iTunes or your whole PC. We have a nice DVD control app below and another remote control for Kodi/XBMC. There's no shortage of great remote control apps out there, so take a look around your living room to identify your requirements and then hit the Play Store. Chromecast was a surprise hit for Google: a small stick on the TV and an app on your smartphone are enough to put content on your TV. Netflix, Spotify and many other apps support streaming. The trick is that the controlling smartphone does have to display the content, so older smartphones are just as suitable. So you can use your old smartphone at home to get all the services you need. Let’s get to a more complex project. You might be able to convert an old smartphone into a Google Home. But your old smartphone needs to be able to do quite a bit and shouldn’t be too old. The minimum requirement is that the device can understand “Okay Google” commands, which doesn’t work on every Android device. But that’s not all: you need a speaker to connect the device via cable or Bluetooth. This is where you can activate Okay Google. Ideally, your phone will already have access to Google Assistant. If it’s not available, you can’t use your old smartphone as a Google Home. Let’s get on with it: the smartphone should be permanently attached to a charger as well as a speaker, of course. Just connect both the cables and you’re free to get started. Some apps work fine with this crafty setup, but not all. You’ll have to open some apps manually, and others won’t support all features. You should try and see what works in your particular situation. If your old smartphone doesn't even have enough RAM to handle some occasional gaming, then you could use it as a bedside clock. Get yourself a nice clock app, such as Timely, and spend a couple bucks on a simple mobile phone stand or go all out on a speaker dock. Don't forget to enable Daydream mode in the display settings, where you can also transform your phone into a digital picture frame or newscaster. One of our readers Yolande Kimmel gave us a practical tip on how to use an old device as a handset for the local network. There are apps that can help you with this. If this isn’t a convenient option for you, you can easily just install Google Duo and activate multi-device access and simply continue to use your old smartphone at home in the future. Skype, Wire and other messengers will also work. Lots of old smartphones have better cameras than many surveillance cameras, so why not repurpose your old smartphone and use it to keep watch over your home? Grab an app such as SalientEye to turn your old Android into an ever-watchful motion detector (which can text message or email you if it senses an intruder), or use the TrackView app to remotely monitor and record video. Home security never cost so little. Baby monitors are ideal for parents who are expecting or have just had a baby. Unfortunately, they’re not exactly cheap. Some of these devices cost between 50 and 100 dollars. It’d be cheaper, actually, to use an old Android smartphone with the help of a baby monitor app. The best app we’ve tested is Baby Monitor Annie. The app is easy to install on two smartphones. One device is set as the transmitter and the second as the receiver. One practical feature is that you can also use the camera of the transmitting smartphone to take a look at the baby. But of course, this requires some power. So you’re probably better off leaving the app in audio mode. If your baby makes loud noises, the app automatically informs you. The Baby Monitor Annie app is free for 30 minutes of test monitoring, and after that there are cheap subscription options: it costs $1.99 for one month and $18.99 for a lifetime account. The app is also available for both Android and iOS, so it isn’t bound to an operating system. Even in the age of streaming services, MP3 files are the most important basic format for getting music on a smartphone. If your old smartphone offers high-end audio output, you can use it as an mp3 player (and also set up your streaming accounts). Android has a wide range of music players and you can even sync your iTunes library with Android if you want. Do you often travel and want to give your devices access to the network? And do you also have a SIM card with enough data volume? Then it’s a good idea to downgrade the old smartphone to an internet hotspot. You can set up the Wi-Fi hotspot in the system settings under Wi-Fi networks. Choose a secure password and then off you go. In some cases it may even be enough to hand over the internet connection of the smartphone to a laptop via cable. An online account is only as secure as its two-factor authentication. But where should the second factor be generated? Text messages are one option, but most of the case you choose your main smartphone, but that’s not really a good idea. Instead, it's a better idea to leave your old phone at home and to activate the authenticator apps from Google, Facebook & co. Yes, you’ll only be able to log into the secured accounts at home, but that means security breaches will only be possible at home as well. Many of the new uses mentioned here aren’t mutually exclusive. Do you have any other suggestions of ways to use your old smartphone? Let us know in the comments! This article was updated in July 2018. Universal remote via Logitech Harmony app. Of course you also need the harmony hub but I already had that. There are other ways to do this too. Thanks for the article! I'm also using my old smartphone as VR Controller from Vasosoft for games. Really useful for gamers! You can also Use your Phone to Measure the Ground Distance , in other words use it as measuring Tape . just download this App from Play Store . Search for Smeasure in Play Store . You can use your old Android Smartphone as a POWERFUL, ACCURATE CAR TRACKER (personal vehicles of course). First, you will need a working Android Smartphone that you may want to give away, trade or sell. Next, go to "Settings" and then scroll to "Accounts"
Log in with your Google or Gmail account. You can also create a new Google account just for this. Make sure that location services in on and actively locating this device. Next, find a secure location in your vehicle and hide your old smartphone. Make sure the area is dry, not too hot or wet. Be sure that it's effectively receiving GPS signal and remains connected to your mobile data network. Then, From another mobile device or from a computer, log into Android Device Manager. Be sure you're logging into the same account that the hidden smartphone (tracker) is using. You'll be able to achieve real-time updates, it's TOTALLY free to use and managed by Google. Don't forget a power cable if your gonna leave it installed. Not hard to wire up a cigarette lighter charger to a 12 volt source if you hide the phone under/in your dashboard. Half of these I'm already doing on my current phone, but will give the offline GPS thing a go. Cheers. There are some very useful apps; I like duolingo. Many don't know that any working phone, even without a telco account, will work tor emergency 911 calls. Some useful alternatives to put that old phone to use rather than as a paperweight. I'm also looking at using my old htc phone to learn about rooting and upgrading it with a newer version of Android. Flashed cm13 rom on my venerable 3yo galaxy note 2, with viperFX, Poweramp and Xposed. Mostly using it as a media consumption and back up device. Despite its 3years it seems to hold water very well. I was using my old faithful S3 as a Security cam with the App "Arnold" all was good.... But now her charging system has gave up, she takes over 36 hrs to fully charge and will discharge fully in 2/3 hrs even when charging. Such a shame she now going into full retirement. Have you replaced the battery? Mine was doing the same slow charging quickly draining. New battery and it's back to normal.